I haven’t blogged for AGES because I’ve been both working on the MA and trying to establish a business for myself drawing at weddings & events. This is a really exciting thing, and I feel very positive about it but it requires a separate post, with links to my new business sites etc – definitely coming very shortly. And here I am posting some work just a few weeks from the end of the semester and hand-in. Funnily enough, I didn’t feel like exposing the work before now, and I also I don’t want to ‘give away’ much of the story. 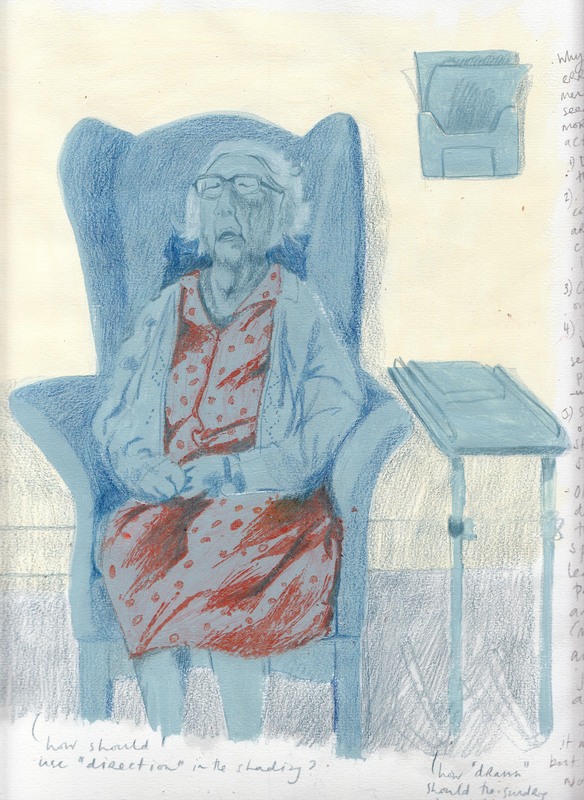 Alongside this work I have been drawing from observation in a local old people’s care home, which I have really been enjoying. This has totally answered the problem thrown up by the first semester’s observation and experiment module; at the end of which I was feeling disconnected and isolated from the subjects and was in need of some kind of a connection to ‘the observed’. By visiting the home for a few hours each week I have become familiar with the people there and I’ve been able to develop a relationship of sorts. 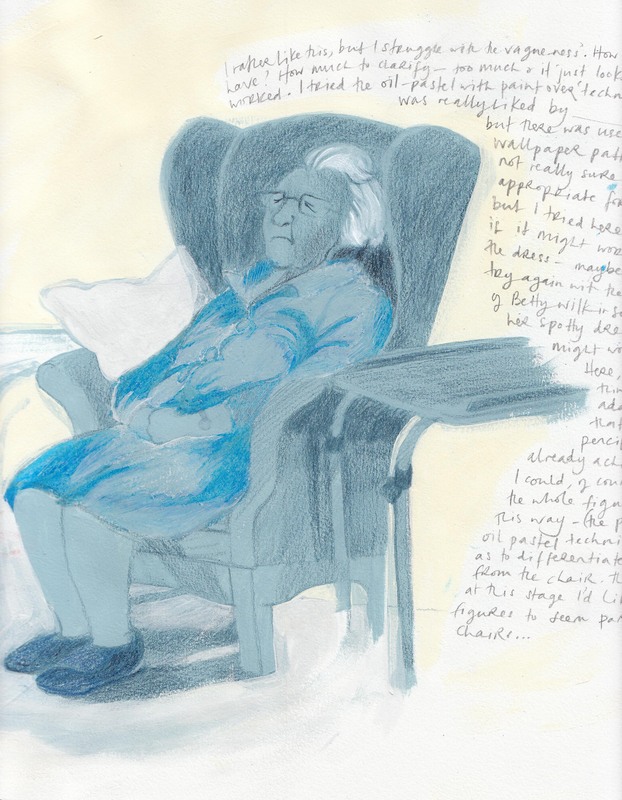 I have not uploaded these drawings simply because of confidentiality really, the ladies and men I have been drawing are not able to give their informed consent as, for the most part, they suffer with a degree of dementia that requires round the clock care. So, why am I drawing in an old people’s home, apart from having ready access to fascinating people to draw, frequently being given coffee, and it being (very) warm? Because the story I am writing is inspired by the ‘Just Imogen’ Doll. I was working on her as the semester began and was late in beginning to think about a ‘sequence’ (the module is entitled ‘the sequential image’). I realised that as I had been creating Imogen I had been thinking about her as if a character which was perhaps just as valid as a drawn ‘character’. I began to draw sequential images around her manufacture and ‘coming into being’, so to speak. As this happened a more important character emerged, which was not the doll itself, but the woman making her (not me, incidentally). This character was a woman in an old people’s home. For reasons of logic this woman is now a nurse/carer in the home – but originally she could have been a resident. Well, I won’t tell you too much more here because I think it’s better to see it rather than read about it – and I’m not sure how much I want to ‘tell’ yet. In the meantime, however – I wanted to say that this has been a great semester for me so far. I have really made progress and achieved a great deal. Not because the story is genius (it isn’t), or the drawings perfect (I actually haven’t yet completed any final artwork), but in terms of the way I have planned the book, understood it and developed the overall look. Previously, before doing the MA, I would work-up spreads in pencil and once pleased with them, paint them in acrylic; ALWAYS & WITHOUT FAIL hating the result. I now know why. I was just ‘colouring in’, with no real thought about the colour scheme, or the overall look of the book. It was hard to keep track of everything… and I used a light box, tracing ‘over’ the drawings to paint. This stifled the life out of the drawing… and now I am free-flying! OK so, I still have to actually produce a final artwork which is both well-drawn and retains it’s original energy. But I am getting closer with these two experiments above. I have answered a few questions through these experiments that will mean a further evolution. But through this searching, this ‘question asking and answering’, however much I begin to think I might know what to do, every question begets another. A new crop of questions emerge…. …this, the difficult birthing called ‘creative process’. The writing (cropped off by scanner) – is mainly these questions… do you want to be able to read them? Let me know and I will scan them and try to include them in an update. It is necessary to say more about these questions soon… in the meantime – comments welcomed on the drawings so far.